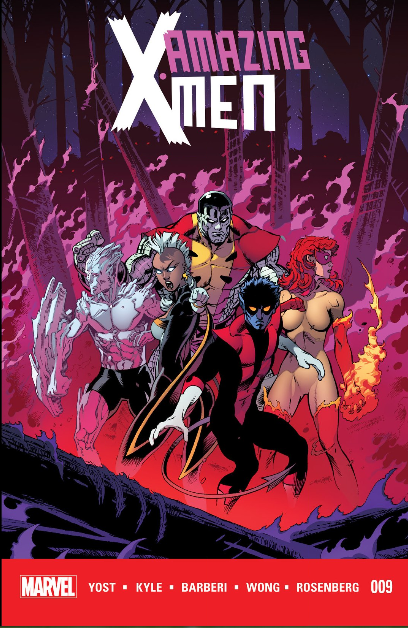 We are just going to ignore how late this review is; in last issue, the X-Men celebrated the return of Nightcrawler. Mystique crashed the party to find out where Azazel was so she could kill him. Which lead to a crazy family meeting and Mystique offering Azazel a job. I know this review is late, but life was crazy – C2E2 and finishing Camp NaNo. In last, issue Nightcrawler managed to beat his father and trap him on Earth. 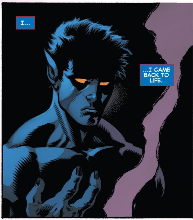 Nightcrawler is also back from the dead but in order for him to come back it cost he had to give up his soul. Sorry for the late posting on this but it was sold out when I went to grab the comic the day it come out so I had to wait for them to get a new shipment. That is what I get for not telling them pull a copy for me. 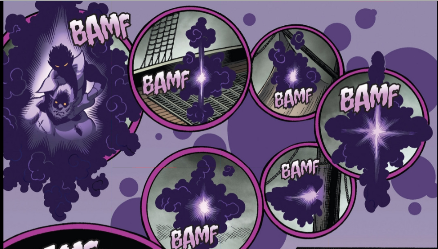 Lets recap what happened last issue well Beast was also pulled into the portal as well. The pirates on the ship holding Storm were getting pissed because she kept beating them up. Nightcrawler came in to save the day and had a moment with Storm. 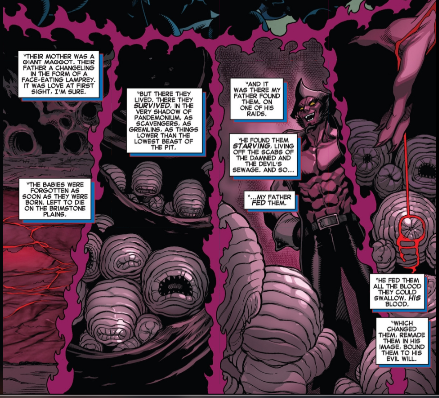 Beast was attacking Nightcrawler because something happened to him the sea of purgatory. 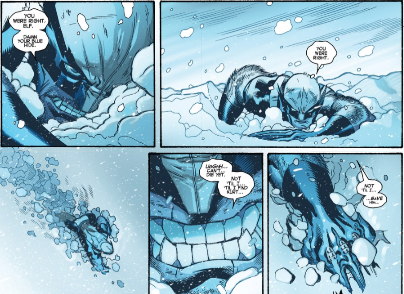 The issue opens with Logan in the frozen tundra looking rather cold. Northstar falls into the snow saying how he has flown everywhere but all he could see was snow. Wolverine said that they have to keep going because they had to find Nightcrawler. 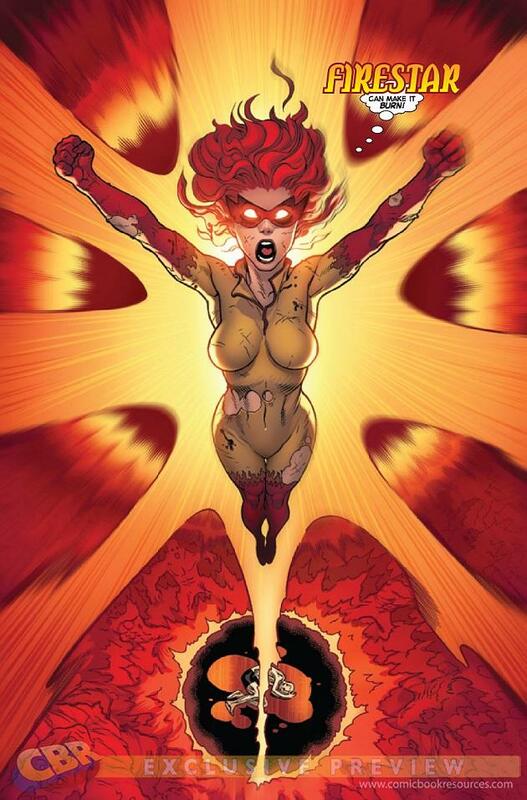 Firestar is still battling demons in hell with Iceman melting on the floor. Firestar is wondering if she should kill Iceman mainly to stop his suffering. 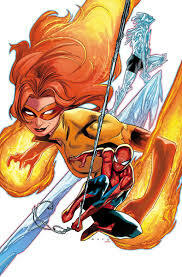 She realizes that he would do anything to save her and she figures if Iceman can freeze hell then she can make it burn. Well Iceman can do things like that because he is an Omega level mutant, but I’ll just leave that alone. 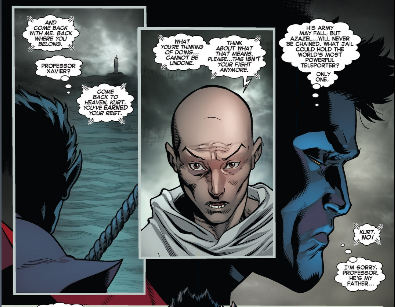 Back on the pirate ship, Beast is still trying to kill Nightcrawler who tries to reason with Beast. Beast please don’t kill me we’re friends. Storm notices a sword in Beasts back. In an attempt to stop Beast, Nightcraweler bamfs him around the ship, which caused Beast to vomit on him – much to Nightcrawlers chagrin. 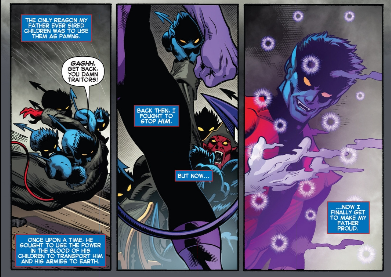 Nightcrawler did ask Beast not to vomit on him, which means he knew that it was a possibility so it’s Nightcrawler’s fault. 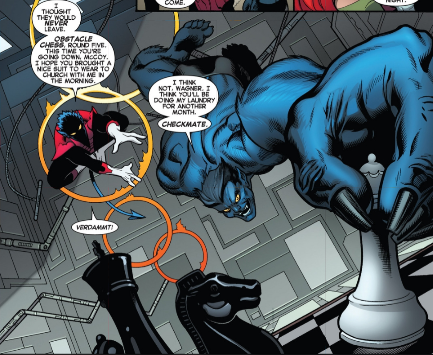 Nightcrawler begs Beast to remember something, which causes a flashback of the team going out to Harry’s but Beast and Nightcrawler did not join them. They instead played another game of Obstacle Chess, which Beast won. 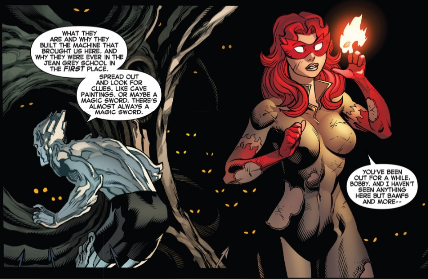 Beast remembers that while Storm pulls the sword from his back. Beast is really happy to see Nightcrawler, who wouldn’t be happy to see their dead friend. 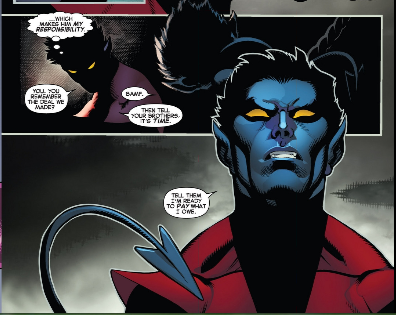 Nightcrawler told Beast that he liked his new face and that he should keep it. Beast likes to change him look around. Strom reminds them that they have the ship to themselves. 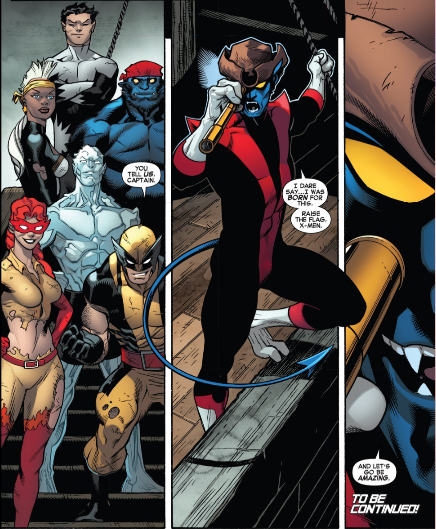 Nightcrawler reminds them that they have to find the rest of the X-Men. 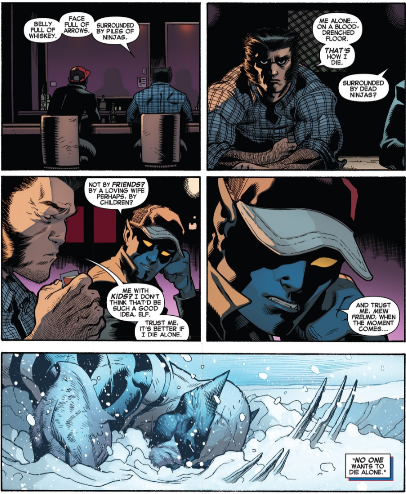 One of the Bamfs gives Nightcrawler a hat, which makes Beast realize that Nightcrawler had sent them. 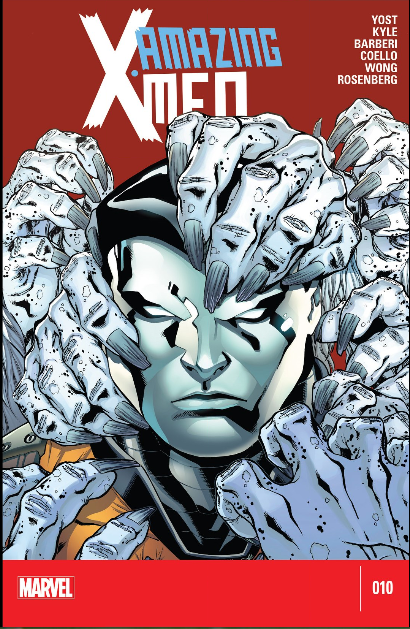 Iceman wakes up thinking his face is melting but then he realizes that he is not melting anymore. Then of course he naturally jumps to the conclusion he is dead. All right, I will give him that one because I would probably jump to the same conclusion. Firestar lets him know that he is not dead she also hopes to stay an X-Men forever. 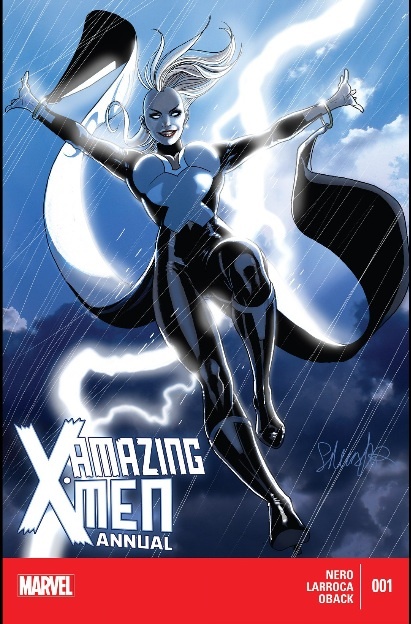 I guess being an X-Men is a good thing now because she was not feeling it when they first got to Hell. Firestar then lets him know that the Bamfs saved them. I learned during this scene is that all the Bamfs apparently speak is bamf and whiskey. Iceman thinks they should look around and try to find a cave painting or a magic sword because there is always a magic sword. Why does Iceman still sound young and stupid, I thought that would stop once he grew up. 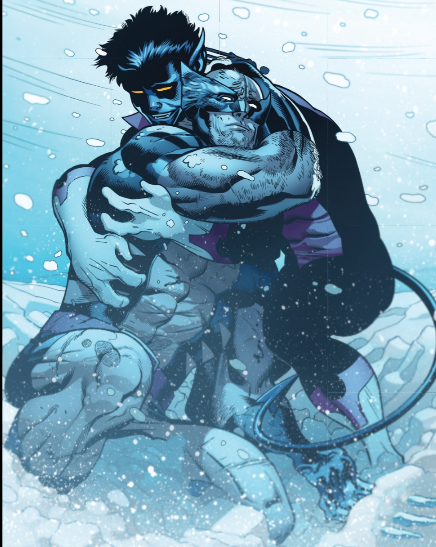 Nightcrawler shows up which of course makes Iceman happy. 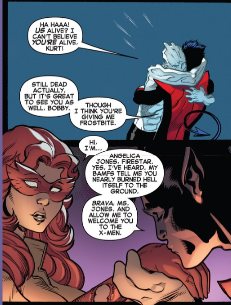 Firestar beings to introduce herself (because that is what you do when you’re in Hell) but Nightcrawler says he knows who she is and what she did as he kisses her hand. 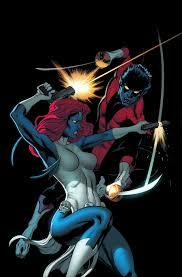 Nightcrawler is smooth; he is getting all the girls. He can have Firestar since Storm is with Wolverine or at least sleeping with him. 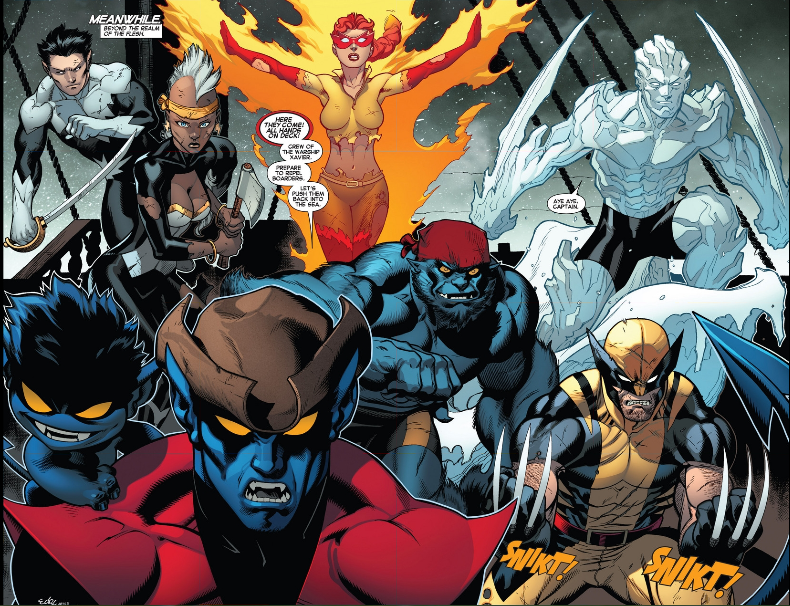 Iceman asks about the Bamfs, which causes Nightcrawler to tell the story of what created them. Most importantly, how his father found them and fed them his blood, which caused them to look, like him. That would explain the red Bamfs but what about the blue ones. 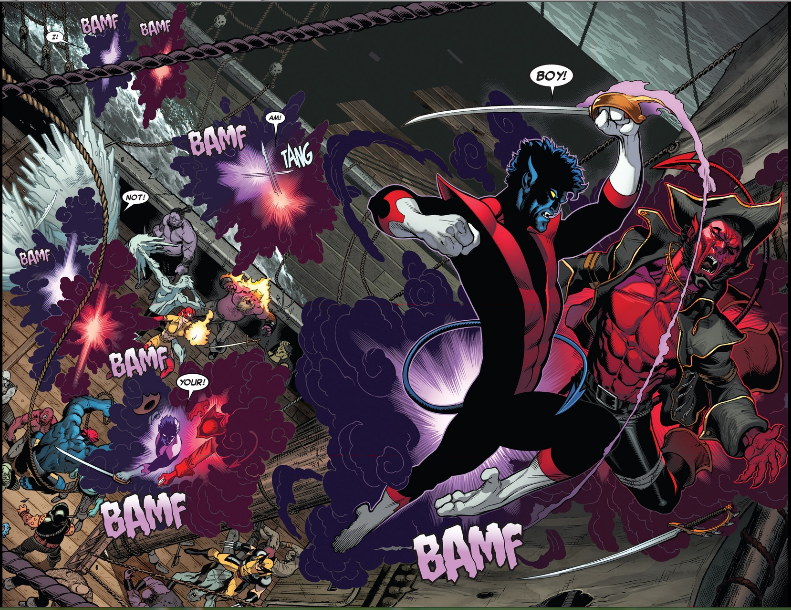 Well the one red Bamf that was left in Heaven, Nightcrawler made a deal with. 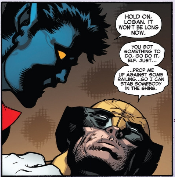 What kind of deal I have no idea because Nightcrawler realized they were talking too much and that they needed to go. 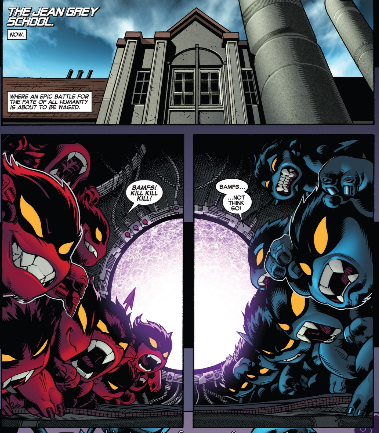 How long were these Bamfs building that machine in the school, because they must have been doing that for a while so how long has Nightcrawler been hunting down his dad? Does time work differently in Hell? Which makes me ask, how long have they been gone from the real world? 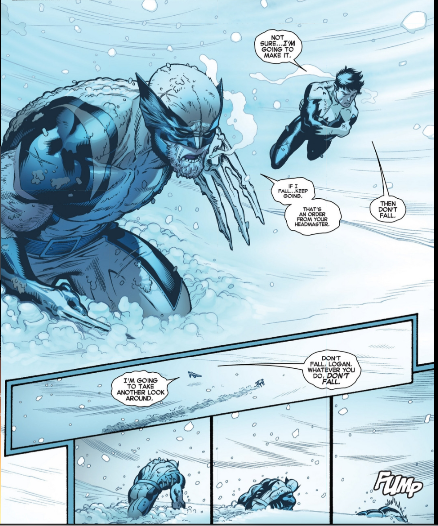 Northstar tells Wolverine that he is worried that they are both not going to make it out of the frozen tundra. Seriously, where did this tundra come from and it can’t be a part of Hell since Hell is hot. I know it’s not purgatory because is where the ship is so where is this frozen section. I doubt it is left over from Iceman. 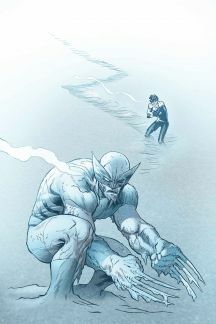 Wolverine tells Northstar that if he (Wolverine) falls that Northstar should keep going. Northstar flies off to look around and Wolverine falls figuring that this is how he is going to die. 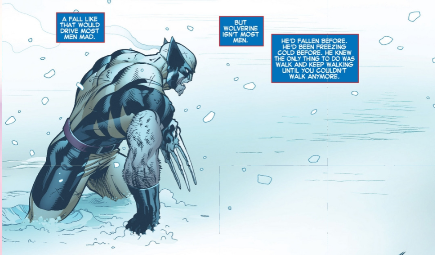 Then Wolverine remembers how he once told Nightcrawler how he would like to die, it was not by freezing to death. 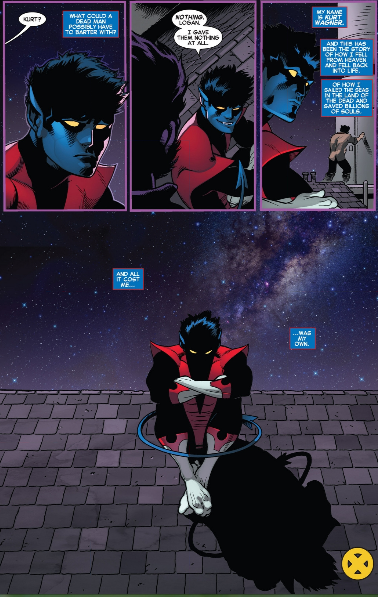 Nightcrawler tells him that when the time comes no one wants to dies alone. 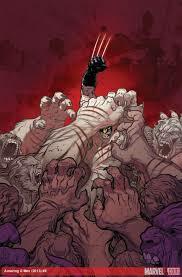 Wolverine than curses Nightcrawler because it gives him the motivation to go on. Then a Bamf appears with Nightcrawler again another happy reunion. 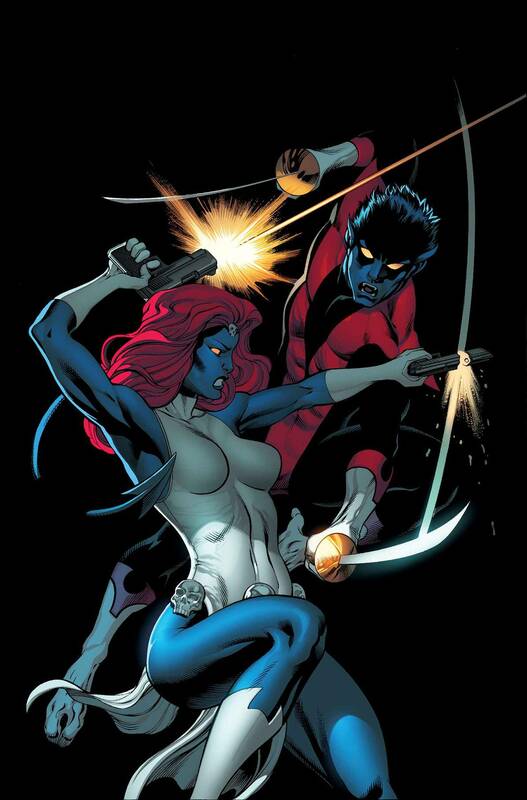 Nightcrawler takes Northstar with Firestar to the pirate ship. 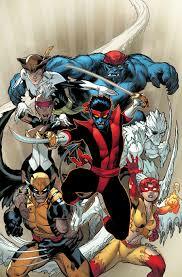 On the X-ship Nightcrawler spies his father’s ships, he asks the X-Men if they were ready for a battle. I have to say I like this issue because it finally brought everyone together, I had been wondering what happened to Wolverine on the fall. I really want to know where that frozen section came from. 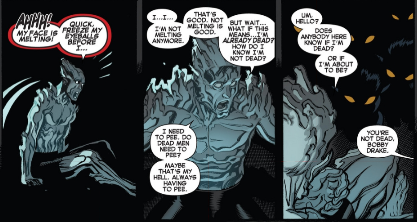 I am happy to Iceman is not melting anymore, although I really wish his frozen Hell had lasted longer. Firestar definitely improved in this issue because I was not feeling her in the first and second one. 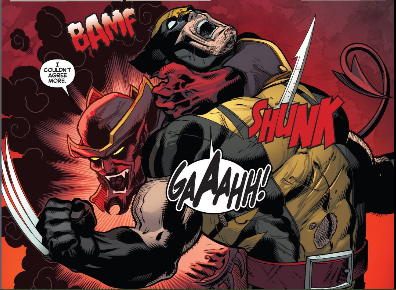 I really liked how both Beast and Wolverine had flashbacks to moments with Nightcrawler, I am a fan of touching flashbacks. 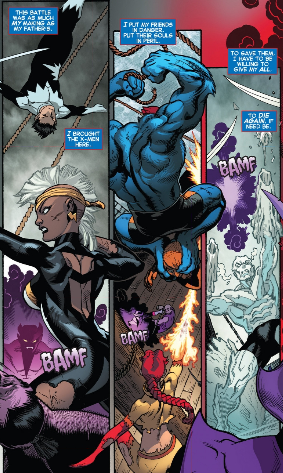 The Storm and Nightcrawler one from last issue was really nice. I am hoping there is an Iceman one in the upcoming issue. I also loved how everyone was so excited to see Nghtcrawler. 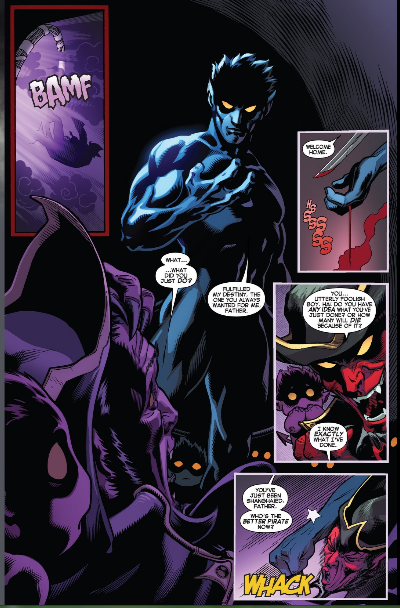 I am looking forward to the battle between the X-Men and Azazel and at this point I am hoping that Nightcrawler will be allowed to come back with the X-Men. 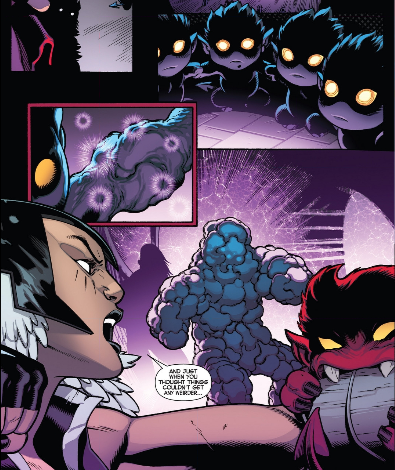 I also want to know that the deal was that Nightcrawler made with the Bamf creatures. I hope that comes out or more importantly we get to see it. Until next issue, I will try to get the next one on time.